Using solar lights is one thing, going for the bright ones means though that you’ve already got the taste of solar lighting and you’re ready to step up your game. Why use solar lights in the first place? For those of you who are still sitting on the fence about going solar, here are the main reasons: it’s cheaper and so much easier than classical illumination. Let’s not forget the part about no wiring whatsoever when installing and using solar lights. Not to mention the part where their versatility and diversity of models really makes out for the big downside: you do need sunlight/indoor light for their solar panel to charge, for later illumination. 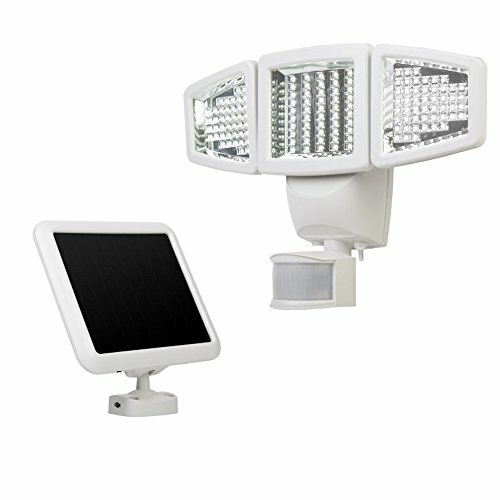 Either you want the solar lights for security reasons or for simply to put under the big bright lights some architectural details, the solar lights may have a various light output. The number of lumens is a good indicator of level of brightness therefore, the bigger the number, the brighter the light. As a general info, anything going more than 15 lumens is considered bright. 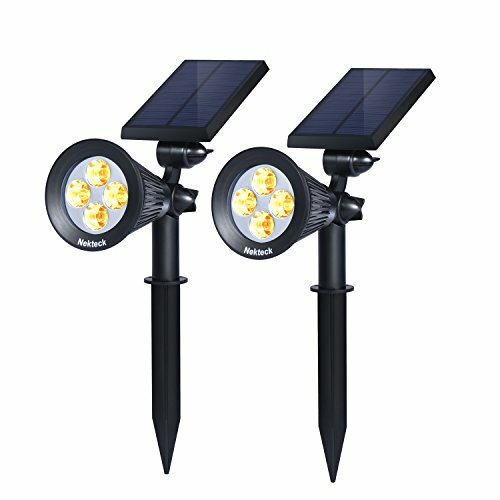 When you want solar lights for security reasons, you may find on the market lights that have even more than 700 lumens so it’s good to know how bright you want your solar light to be. In addition, how much you’re willing to pay, as well. Check the solar panels of your solar lights and keep in mind that the larger they are, the more sunlight they get therefore, more efficient. You also want the batteries to hold their charge (you don’t bright lights for just 2 hours in the night) and to take a good beating. 1). 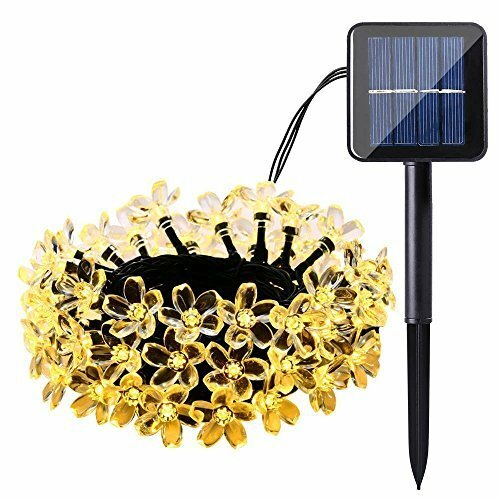 If you’re looking for some pretty, bright, string solar lights, you may give it a go with the Qedertek 21ft 50 LED Solar String Lights Waterproof Solar Garden Lights. The string solar lights look nice and manage to create a bright, pretty detail in any area you’d place them. The light is warming up any area, increasing your comfort. The flower blossom effect is pretty and the fairy design leaves a romantic, dreamy atmosphere. The solar panel charges throughout the entire day and the lights turn on automatically at night, running for 8 hours on full charge. The build of the lights is durable and waterproof as they’re made with tough hard plastic, taking the use for a good amount of time. It’s easy to install the lights and the one button for power makes easy the operation. The lights are versatile and you may use them for tree house, pergola, home, patio, and so on. Pretty and bright, the string solar lights are a low-priced option that you may try. All in all, for the buck you pay, we’d say you end up with some pretty, bright and versatile lights that may do wonders on your patio, let’s say. 2). We all know how easy to install are the solar lights and the Swiftly Done Bright Solar Power Outdoor doesn’t fall far from the tree either. You simply peel and stick it to any surface (metal, glass, wood, and so on on). The glue is very strong and the light stays in its place. However, it’s not only the easy installation we like on the light. We also appreciate its strong build, which makes the light weather resistant and heatproof as well. An automated switch saves energy so the light turns on automatically at night and off once the morning has come. When there is no motion detected, the light gets into dim light mode. The bright light mode activates once a motion is identified. It stays that way for 10 seconds after motion stopped. The light detects movement within 10 feet, 120 degree angle. The solar panel is efficient and has a 5 years life span. 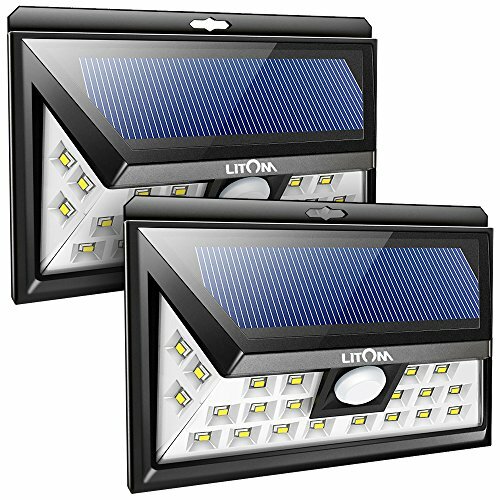 Easy to install and well priced, the light is a good choice to try. All in all, for a good price, you get a reliable, bright light that serves you well for quite some time. 3). Are you looking for a solar light to secure your home? You may definitely put your trust and faith in the Litom 24 LED Solar Lights Outdoor, Super Bright Motion Sensor Lights Wide Angle. The light is bright and reliable and the 3 LEDs on both sides increase its efficiency. You may install the light to illuminate your deck/garden/pathway. The wide-angle design helps the light cover a big area. The lighting angle may get to 270 degrees and this is impressive for a solar light. In order to get best performance, you need to install the light in direct sunlight. You don’t need wiring for installation or use, but be sure it gets enough sunlight all day so it charges and runs for longer at night. The light present adjustable operation and you may choose one of the three modes: full-on (for your front door, let’s say) and the reduced light mode (for a driveway). Set the motion-detected mode if you want to illuminate your garage or a fence. The motion sensor presents good sensitivity and may detect movement from 26 ft. away. You may have to place it at 5.6-6.6ft. for best results. The tough build of the light ensures use for a long time, in difficult weather conditions. It’s made with high-impact ABS material and has an IP65 waterproof grade. It can definitely handle a drop or a rain. The bright light and rugged construction, along with the wide lighting angle recommend the light as a great choice when in need. Despite the minor issues, for the wide lighting angle, tough build and bright light, you shouldn’t skip this from your shopping list when you want to secure your residence. 4). Just because some lights aren’t pricey, doesn’t mean they can’t serve you well. 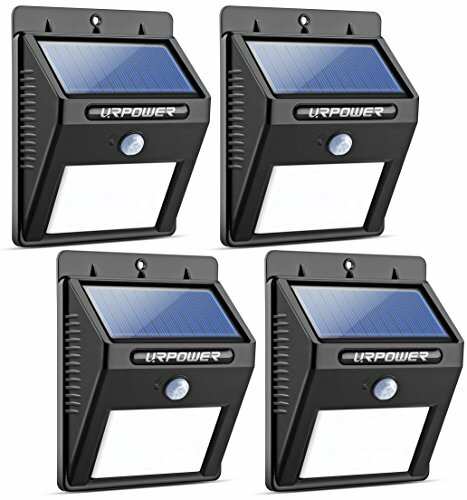 It’s the case of the URPOWER Solar Lights 8 LED Wireless Waterproof Motion Sensor Outdoor Light for Deck that come with a pretty long list of good things attached. Forget about easy installation; most solar lights out there don’t need wiring for installation and these lights don’t fall far from this tree. The lights come also with an automated switch, which means you don’t have to turn them on/off. They automatically do it when the night/morning comes. The list of good things continues with a build-in switch that is efficient and has a range distance to 10ft., whereas the sensing angle is a good 120 degree. As we go further with the details, we see the tough build and the IP64 waterproof grade of the lights. Therefore, they can definitely take a snow or some splashes. The risk for overheating is minor as the lights are also heatproof. The solar panel needs at least 8 hours of charge in order to provide a 12-hour run for the light. Nevertheless, it’s effective and lasts for 5 years. Easy to install, bright, dependable and well made. This is not the description of a lemon, for sure. Solar lights don’t have to be sophisticated in order to be bright and reliable. Easy to install and tough would do just as well. 5). 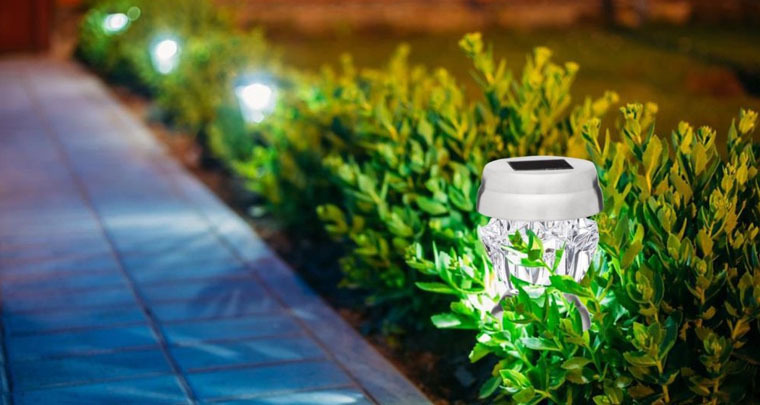 Even though the Solar Lights, URPOWER 2-in-1 Waterproof 4 LED Solar Spotlights come with so many good things, it’s the compact shape that makes them stand out. You may stick the lights into the ground or wall-mount them-whatever fits your residence better. Either way, you don’t need wiring for neither or the screws for the wall-mount are included. One thing we really like about the lights is that you may use them both inside and outside. Additionally, they are very easy to adjust so that the solar panel gets good sunlight exposure. The lighting angle is also adjustable as you try to get the best illumination for a designated area. The Li-Io batteries don’t just charge well during the day, but they also keep the charge for long, running the lights all night long. The lights turn on automatically in the evening and stop early in the morning. Less worry for you as you don’t have to remember turning them on/off. The two lighting modes of the lights let you choose the right setting for a specific situation, giving you a maximum output of 200 lumens. Each light works on its own, though. The construction of the lights sustains their performance and the lights handle the weather challenges. The IP64 waterproof grade lets them take a splash, whereas the compact design extends their lifespan. For the good build, bright light and versatility, you sure don’t feel like buying a lemon with these lights. 6). Adjustable and versatile, the Nekteck Solar Powered Garden Spotlight are a great choice for anyone who wants to stay on the safe side when shopping for illuminating the outdoors. 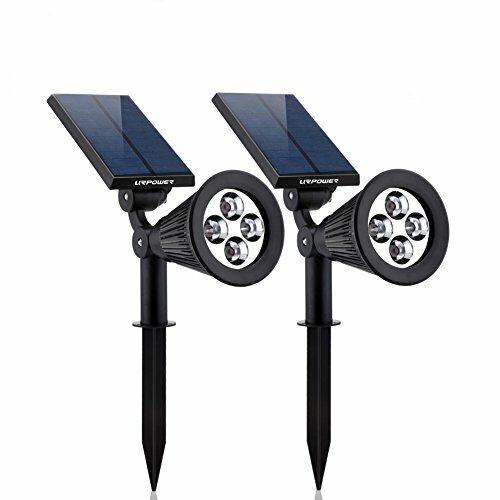 The solar spotlights give a maximum output of 200 lumens and take a rainy day, as they are waterproof. They’re also heatproof so the risk for overheating shouldn’t worry you. The adjustability of the light and the solar panel allows you to get the best illuminating angle for your area. As for the solar panel, you need to set it so that it gets the best sunlight exposure every time, for better charging. It’s an efficient solar panel that works even on cloudy days. The built-in rechargeable Li-Io battery may run for even 10 hours when fully charged and takes the intense use. As for the automatic operation, the lights check this box also, turning on automatically at dusk and off in the morning. The two lighting modes mean you may use the high/dim mode light so you save even more energy. The list of good things continues with the easy installation and the fact you may wall-mount or insert in the ground the lights, according to your needs. Adjustable, dependable and with many good things attached, the lights should be on your list if you’re shopping around. Regardless, for the versatility and efficiency, the lights are worth to try when in need. 7). One thing we really like about the Sunforce 82153 150-LED Triple Head Solar Motion Light, 1000 Lumen Output is the great adjustability as you may move the lamp head upwards, downwards, but also horizontally. This way you get the best illumination for a specific area. This is why the lights are such a great option for entryways, sheds, pathways or garages. The adjustability doesn’t stop here and you may set the detection distance and the light duration as well. The amorphous solar panel doesn’t need direct sunlight, which means it’s efficient and reliable even on a cloudy day. The lights come with 150 bright white LEDs, helping you better secure your property at night. The construction of the lights doesn’t disappoint and the lights are weather resistant, giving you the possibility to mount them wherever you want. Obviously enough, you don’t need any wiring for installing or operating the lights. Reliable, strong and adjustable, the lights make you feel safe at night, for a long time. For what it’s worth, we still consider the lights to be one of the brightest and dependable options when you want to feel safer at night. 8). When you’re willing to pay the extra buck, don’t get simple bright solar lights, but also lights that bring an elegant vibe to your garden/yard. The Gama Sonic Baytown Solar Outdoor LED Light Fixture match the description and their beautiful design sure changes for the good any outdoor. The solar lights come with build-in solar panel and 10 LEDs, Gama Sonic’s patented cone reflector and the mounting kit you need for installation. The lights are versatile that way and you may wall, post or pole mount them. The lights aren’t only about the looks, but they also come with many other good features. They present automatic-on feature (dusk-to-dawn) and the Li-Io battery is efficient and holds its charge. Another good thing is the adjustability of the lights as you may set the 80 lumen bright white or the 70 lumen warm white, according to the situations. The build of the lights matches their performance. The monocrystalline silicon solar panel features a protective tempered glass that’s easy to clean and long lasting. The lights are made with powder-coated cast aluminum that doesn’t rust. They also feature beveled glass and handle the weather challenges. Elegant, durable and bright, the lights may satisfy even the most pretentious customer. For the elegant design, rugged build and bright lights, you can definitely put your money at stake with these lights. 9). Step up your game and the commercial grade solar light you’ve always dreamed of. 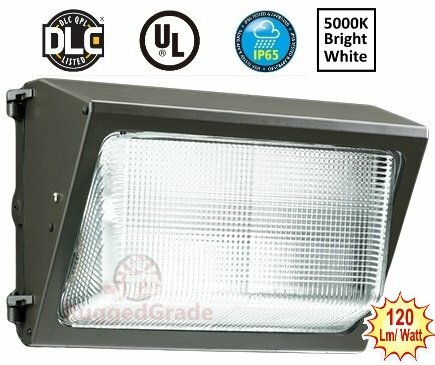 The 100-Watt LED Wall Pack light – 11,700 Lumens- do makes things bright, so much brighter so it’s difficult to resist them. The lights have a good design and include industrial LED Wall Pack Light. The maximum output is 11,400 lumens and the 5000K light color gives a bright clear light every time. The lighting angle is wide, bigger than 100 degrees, covering a wide area. The built of the lights sure sustain the performance. The aluminum housing features high tech Heat Sink and better heat dissipation. The LEDs last longer and the IP65 waterproof grade helps the lights take more than just one rainy day. The lens is made with tempered glass, improving light distribution. The installation isn’t difficult, but you may want to take a better look when doing it. You may also add dusk to dawn sensors if it fits better your needs. The lights are heavy-duty and make a better choice for the commercial areas. Nevertheless, for the rugged build and impressive output, you can definitely put your money at stake in these lights. 10). 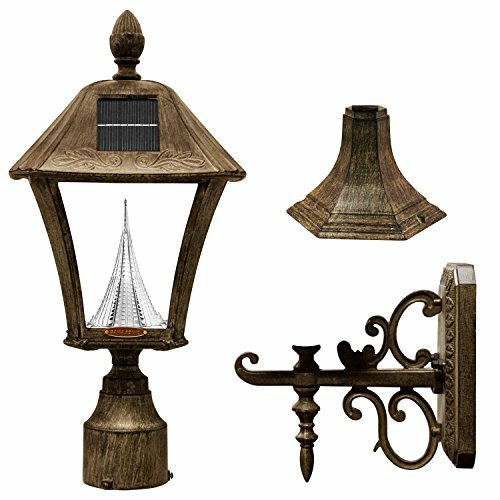 Give your residence a touch of elegance with the Gama Sonic GS-94C-D Victorian Solar Lamp Post. The light comes with a 5-watt solar panel and 2 downward hanging lamp heads. The patented Gama Sonic’s cone reflector enhances the 13-LEDs for better performance. The light is designed for dusk-to-dawn operation when the battery is fully charged. The Li-Io battery charges during the light and, most importantly, holds its charge for a night run of the light. Each lamp gives a maximum output of 200 lumens. An on/off switch lets you turn off the light if you don’t want it in a specific time. Furthermore, you may also adjust the brightness level using a high/low brightness switch. The build of the light is also great and the light is made from powder-coated cast-aluminum that doesn’t rust and is weather resistant at the same time. Each lamp head features real beveled glass panes that give nice, clear light. The solar panel matches the build of the light. It’s made of monocrystalline silicone and is protected by tempered glass. This way it’s not only more durable and reliable, but also easier to clean. The light is easy to put together and to use the light. The 90 inches pole has good stability and the elegance style makes a nice impression every time. Bright, with a strong build and classical design, the light changes for the better any outdoor space. No matter how you put it though, for the elegant appearance, bright light and good build, the light is worth every single penny.